Even though its been a little more than a month the recovery effort is still on going on the east coast after the horrible events of Hurricane/Superstorm Sandy. Things are better than before but there is still a long way to go! To help out, Formula Drift has decided to put on a fundraising event at Irwindale Speedway AKA “The House Of Drift”. At this event individuals can pay for ride alongs with Formula Drift drivers Dai Yoshihara, Justin Pawlak, Odi Bakchis, Kyle Mohan, Pat Mordaunt, Jeff Jones, Marucio Ornelas, Ryan Kado, and Danny George. There will also be raffles with prizes provided by Sparco, Fatlace, Yoshihara Design, Nitto, Alpinestars, ACT Clutches, Motegi Racing, Discount Tire, EBC Brakes, Falken, K&N, and more. Proceeds from buying Ride-a-longs and raffle tickets will go towards the hurricane Sandy relief effort. Attendees can also make donations to the Red Cross on site. The event will be free to enter and its all going down December 13th from 6pm to 9pm! So if you are in the area, head out to the House of Drift, get a ride along and contribute to the effort! Why: To help rebuild the east coast! 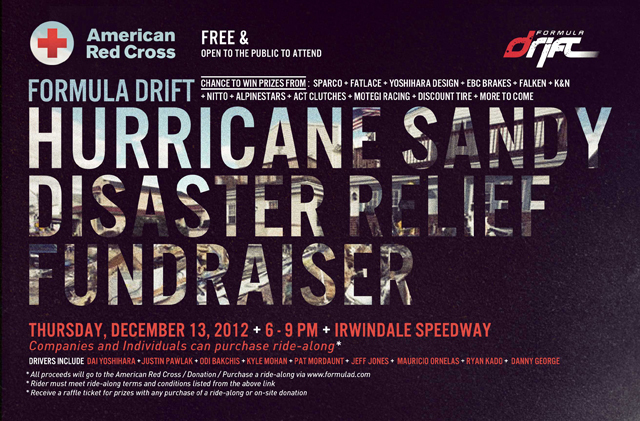 Long Beach, Calif. – December 3, 2012 – Formula DRIFT has announced a special charity event to benefit the American Red Cross’s Hurricane Sandy relief efforts on December 13 at Irwindale Speedway. Professional drift ride-alongs from Formula DRIFT stars will be for sale to the public with proceeds to going to the relief fund. Formula DRIFT ride-alongs from the Series top drivers such as Daijiro Yoshihara, Justin Pawlak, Odi Bakchis, Kyle Mohan, Jeff Jones, Danny George and more will be available to give once in a lifetime ride-alongs that will be for sale. Raffle tickets will also be on-sale at the event for a chance to win great prizes from Formula DRIFT partners including Sparco, Fatlace, Yoshihara Design, Nitto, Alpinestars, ACT Clutches, Motegi Racing, Discount Tire, EBC Brakes, Falken, K&N and more.